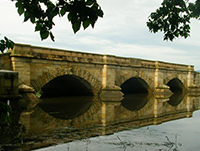 The unique and exquisite sandstone Ross Bridge was completed in 1836 and is the third oldest, and one of Australia’s finest sandstone bridges in Australia. The Ross Bridge replaced two previous structures, both of which were approx 100 metres upstream from this existing one. The two originals were made of 14 buttresses and covered with logs and clay. They were both unsuitable due to the river flooding in winter. John Lee Archer, a colonial architect and civil engineer designed the bridge originally with 5 arches to fit the width of the river next to the old bridge. Roderick O’Connor, inspector of public works, opposed the idea, suggesting that the foundations at the present site were more suitable, therefore John Lee Archer changed his plans and found that a 3 span bridge would fit perfectly. The bridge took five years to complete with convict labour – not due to convict laziness – most of these men were working two jobs. The extreme shortage of free, skilled labour had created a situation in Van Diemen’s Lane in the 1820s where it was almost impossible to build a house legally. The artisans at the time were convicts, and they were constantly engaged on Government Projects. However, by the standards of the day, their hours were not long, nor their tasks particularly arduous. This meant that they had the surplus energy and especially in the summer, the time to take on extra work. Sometimes a settler with an ear in the Governor could have such contracts approved, or such work could be approved to an indulgence to a favoured convict, but on the whole it was forbidden. However it was necessary, which meant it went on – but someone in authority had to look the other way – and of course this meant they usually had to be paid to look the other way. In other words, the shortage of free, skilled labour had made corruption endemic to the system. What was going on at Ross at the time however was not the usual type of corruption; it was nothing less than a challenge to the Government’s authority. The convict masons had been occupied quarrying and facing stones for months and years and yet the bridge did not grow. What did grow however, were the houses of the local gentry and the village of Ross. The sqirearchy of Ross seemed to take for granted that the convict department existed solely for their benefit. George Arthur, could not allow such an affront to his dignity, and sent in a special constable – Jorgen Jorgensen, with a team of men to clean up the town. This still did not work, and the bridge was only completed when Arthur ordered two skilled masons to the town, Daniel Herbert and James Colbeck, to work under a sensible military superintendent, Captain Turner. It is important to note, although convicts Herbert and Colbeck were sent there to get on with the bridge it was very much the carrot used to get production out of them not the stick – let alone the lash! They were to be allowed to take on outside work, and they were to receive conditional pardons on finishing the bridge. This worked – the bridge was now built, with its extraordinary decorations, in good time. The icons on the bridge, 186 in total, took approximately 15 months to complete and comprise of animals, birds, insects, plants, Celtic designs, and heads of local personalities and authoritarians. The sandstone was quarried locally and was ground and cut by convict chain gangs. The bridge was opened in 1836 by Governor Arthur and the remains of the old ones were detonated. So everyone was happy, really. Ross finally got its bridge, Herbert and Colbeck got their freedom, Arthur got another monument to his time in Van Diemen’s Land (just as he was leaving it), and Turner got his name on all four corners of the bridge, and of course, the gentry had their houses.